Anger is a human emotion felt every time we perceive a threat to our wellbeing and sense something wrong. The unexpressed anger demands a release which if done inappropriately can hurt your loved ones and ruin relationships. But still expressing anger appropriately is a better choice than suppressing anger. 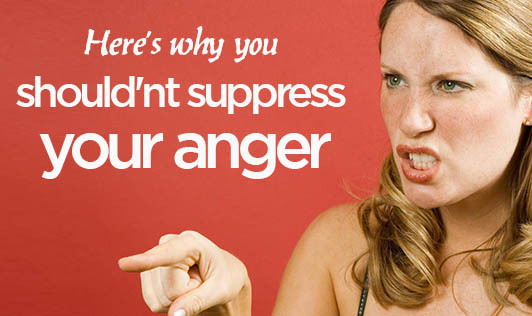 Suppressed anger often leads to an uncontrollable outburst that can cause more harm than the regular release of anger. Suppressed anger can also affect your health and day to day activities. Chronic suppressed anger can lead to high blood pressure, heart disease, skin problems, headache, or violent behavior. Deep breathe when your temper rises, and count backwards from 1 to 10. Divert your thoughts and attention to something pleasant. Go for a long walk or hit the gym. Talk to a friend or read a book or watch a comedy show. If it helps, maintain a log of when you feel angry and what triggers your anger. Meet the person who has angered you and discuss things calmly. Try to see his / her point of view by listening carefully. If none of the simple steps help, then you need to consult a psychologist. It's better to learn to deal with your anger now to avoid complications later.